The Aral sea was once one of the four largest lakes in the world with an area of 68,000 km2 (26,300 sq mi). 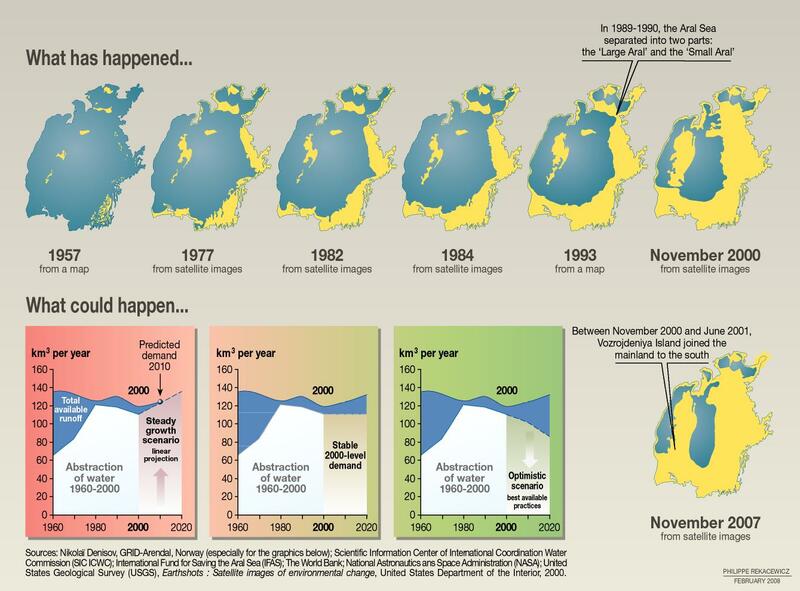 But, since the 1960s, the Aral sea has been facing a huge decline and it’s steadily shrinking. 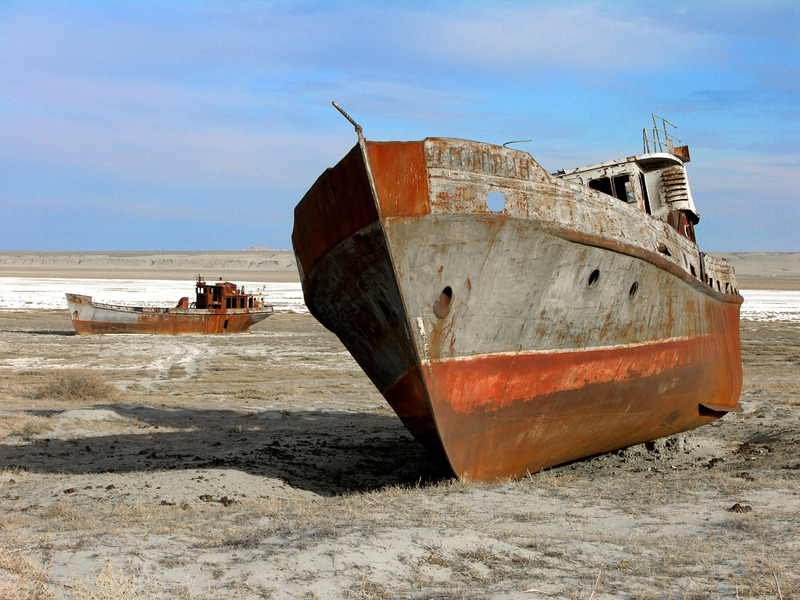 It is estimated that about 80% volume of the Aral Sea had been lost. It took only 50 years for the lake to dry out, and unfortunately, humans are to blame. The Aral Sea is actually an immense lake, lying in the endorheic basin between Kazakhstan in the north and Uzbekistan in the south. This vast body of fresh water once provided thousands of tons of fish. Two rivers – Syr Darya and the Amu Darya, used to deliver a huge amount of the water into the sea. This lake, located in the dry desert, could get only one-fifth of water through the rainfall. In normal conditions, evaporation causes the water level to decrease by the same amount that flows into the Sea, making it sustainable as long as inflow is equal to evaporation on average. But, in the 60s, Soviet wanted to become the world’s largest cotton producer, especially Uzbekistan and Turkmenistan. Cotton boosting had required a major expansion of the canals, so the Soviet Government started building irrigation canals. They diverted Syr Darya and Amu Darya rivers, so they could irrigate the desert region surrounding the Sea. In order to employ agriculture and cotton industry, rather than supply the Aral Sea basin, they’ve destroyed the Sea and its fishery. By 1987, the Sea lost 60% of its volume. In 1998, the water level was down by 20m. As water declined, it has split into four lakes – the small North Aral Sea, the eastern and western basins of the once far larger South Aral Sea, and one smaller lake between the North and South Aral Seas. In 2014, the Southern Sea’s eastern basin completely disappeared. During the period 1997-2001, Soviet succeeded in their intention of building the world’s largest cotton industry, and international trade in cotton products constituted 2% of the global merchandise trade value. But the water retreat in the basin has caused many changes in the Aral Sea Region. From demographic to climate changes, the shrinking of the Aral sea affected almost everything and everyone in its surrounding. The Aral sea became extremely polluted with fertilizer and pesticides, with the extreme salinity of 100g/l (the Dead Sea’s salinity varies between 300 and 350 g/l and the salinity of ordinary sea water is around 35 g/l). The pollution and salinity increase have had an impact on biodiversity, killing the most of the sea’s natural flora and fauna. With the fish disappearance, the fisheries and the entire community that depended on them collapsed. Fishing and other water-related activities have completely declined. The lake became so-called “The ship cemetery”. The empty and dried lakebed became a desert, spreading the harmful, contaminated blowing dust. The wind from the Aral Sea carries more than 200,000 tons of salt and sand every day within a 300 km radius. Diseases like anemia, cancer, and tuberculosis, and the presence of allergies, are also on the rise, according to reports. The loss of the moderating influence of such a large body of water even affected the climate. The winter became colder and summer hotter and drier. Climate change, economic problems, health issues, rising unemployment, and poverty has led to a major exodus from the region. may have saved the northern part of the sea. All of the water flowing from the Syr Darya now stays in the Northern Aral Sea, which slowly recovers. 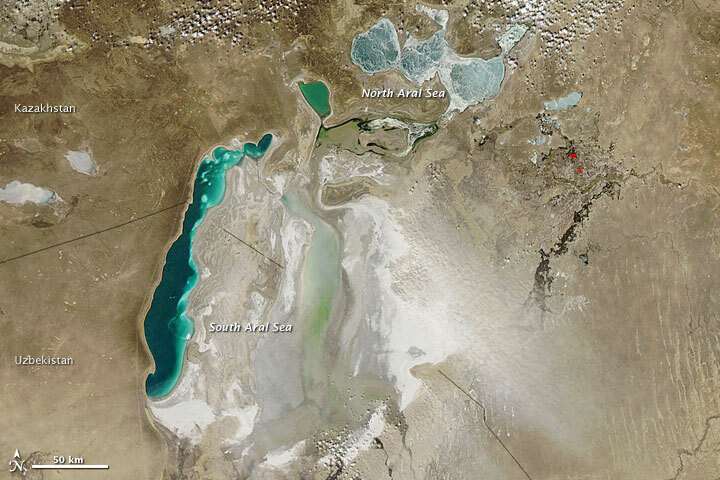 The South Aral Sea is, unfortunately, left beyond saving. 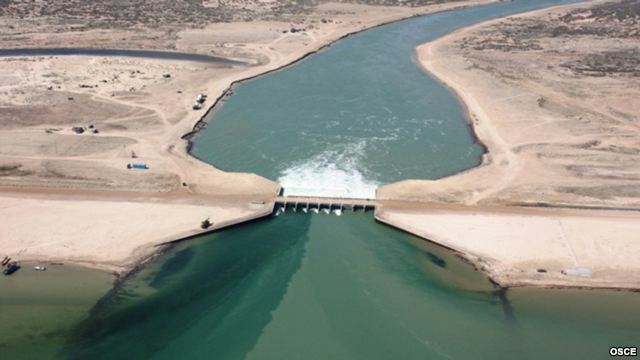 Many different solutions to the problems have been suggested over the years, from changing irrigation practices and installing dams to fill the Aral Sea basin, to redirecting water from Volga, Ob and Irtysh Rivers. In January 1994, former Soviet federations Kazakhstan, Uzbekistan, Turkmenistan, Tajikistan, and Kyrgyzstan signed a deal to pledge 1% of their budgets to help the Aral Sea recover. These five countries have adopted the Aral Sea Basin Program in 1994 in order to save the Aral Sea and rehabilitate a disaster around it. Though there are many efforts to recover the Sea, there is also a great doubt it will actually recover. Some of its parts can be restored, but the large area of the lake is beyond retrieve, so as economy and communities that used to rely on this once large body of fresh water.